Philipp Manz was born on 9 June 1864 in Rhine, Sheboygan County, Wisconsin. Jacob Manz and Anna Maria Spindler, appeared in the US federal census of 1 June 1870 in Rhine, Wisconsin. Other members of the household included Philipp Manz, Elisabeth Manz, Ludwig Manz and Frederick Manz. Jacob Manz and Anna Maria Spindler appeared in the US federal census of 1 June 1880 in Rhine, Wisconsin. Other members of the household included Philipp Manz, Frederick Manz. He married Louisa Helen Martha Brieske, daughter of Wilhelm Brieske and Friederike Zabel, on 8 October 1889 in Rhine, Sheboygan County, Wisconsin, at Elkhart Lake, in the Evangelical Church. Philipp Manz and Louisa Helen Martha Brieske appeared in the US federal census of 1 June 1900 in Rhine, Wisconsin. Other members of the household included Hattie Manz, Arno Henry Manz, Marvin Manz, Reuben Manz and Jacob Manz. The following appeared on 26 November 1937 in The Sheboygan Press: Frederick Manz, aged 76, resident of Kiel for the past 31 years, passed away at the family residence at 808 St. Paul street at 2:45 a.m. Thursday, after a lingering illness of six months. 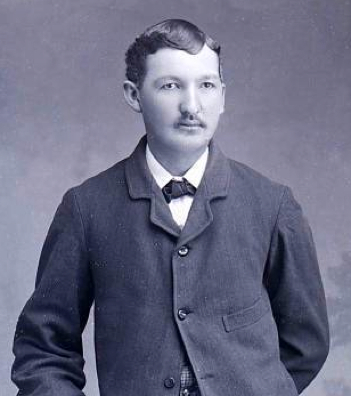 The deceased, the son of the late Jacob and Anna Marie Manz, was born in the town of Rhine on May 10, 1861. He received his early education in the district schools of Rhine and after his school years assisted his father with his farm duties until he was 28 years old. On March 24, 1885, he was married to Miss Sophie Schmahl, also of the town Rhine, the ceremony being performed on the Manz homestead in Rhine township by the late Rev. J. H. Langpaap. After their marriage the couple resided on the homestead for a year and 21 years in Elkhart Lake where the deceased was a section employer. For the past 31 years the Manz family has resided at their present home on St. Paul street. While in Kiel, Mr. Manz was employed a short time in the Kiel Wooden Ware company plant and for many years in the Kiel Furniture company, now the Kiel Table company. Twelve children were born to the couple of whom four have passed away. Survivors are his wife; 4 daughters and 4 sons; Mrs. Peter [Nelda] Belsher of Kirkland Lake, Ontario, Canada; Mrs. William [Linda] Reseburg of Waupun, Mr. Carl [Anita] Hanke of Fond du Lac, Mrs. Raymond Johnson and Frank, Arthur, Alvin and Benjamin, all of Kiel; 25 grandchildren and one brother, Philip Manz of Plymouth, also survives. Funeral services will be held on Saturday afternoon at the C.J. Meiselwitz Funeral Home here at 2 o’clock. The Rev. E.L. Worthman will officiate and burial will be made in the Trinity Reformed cemetery in the town of Rhine. Philipp Manz died on 3 March 1939 at age 74 in Sheboygan, Wisconsin. He was interred at Woodlawn Cemetery, Plymouth, Sheboygan, Wisconsin. Louisa Helen Martha Brieske became a widow at his death. The following appeared on 4 March 1940 in a local newspaper: Philip Manz, 75, passed away at 4 o'clock Sunday morning at his home southwest of this city. Mr. Manz had been in ill-health for the past seven years and had been seriously ill for the past month. /P/ Mr. Manz was born June 9, 1864, in the town of Rhine, the son of Jacob and Maria Manz. He was married on October 8, 1889, to Miss Louisa Brieske, in the town of Rhine, for the past 33 years the family has resided at the present farm home. /P/ He is survived by his wife; the following children, Mrs. Walter [Hattie] Streiber of the town of Rhine, Arno of Howards Grove, Rueben and Arlean at home, Mrs. Jac. [Carola] Minch of the town of Plymouth, Gilbert of here, and Harold, in the navy, stationed at San Diego, Cal; 15 grandchildren and one great grandchild. A son, Marvin, died about ten years ago. /P/ Funeral services will be held Wednesday afternoon at 1:30 o'clock from the Wittkopp Funeral Home. The Rev. Herman G. Schmid will officiate and burial will be made in the Woodlawn cemetery. /P/ The body may be viewed at the funeral home Tuesday afternoon and evening and up to the time of the services on Wednesday.